Why You Should Invest in Locksmtihing? Many people don’t know the finer points of the emergency locksmith profession, and they have no idea what to expect when you call a locksmith. It is not an indictment on them (or you, if this describes you). Not a lot of information about the job is made public. This can make it difficult to get information, and very easy to become misinformed. Some people see being a locksmith as a quick way to make money. It is not always seen as a noble trade or even a difficult range of skills that requires constant learning. But there is a great deal more to locksmithing than the average consumer would guess. Taking on the title of locksmith comes with responsibilities and expectations that most shy away from. It is a lifelong investment. It is a commitment to an education that never ends. And it is not always an easy job. It takes a certain type of person that loves the work and is always striving to be better. Becoming a locksmith requires a lifetime investment. More than a financial investment, this trade demands the never-ending necessity of your time. That time is spent learning and practicing. Getting better, refining your craft, and changing with the demands of the consumer. Many skills of the profession are perishable. That means that if practice halts for any amount of time, the ability will atrophy. Lock picking might not be called for over the course of several days, and, as a result, your ability diminishes. For instance, if you prefer manual picking over electric picking, it is important to practice. The only way to combat that is to always be practicing. Even when the job does not demand something, it is still demanding it. Lock picks, security pins, and other parts of the locksmith arsenal can be made and these will be a handy addition to any lock pick set. It is going to take time to learn and perfect the process of making some of your tools. Making these materials can result in superior supplies, but getting to that point is going to require trial, error, and a whole lot of time. There will most likely be an investment in this process too, depending on your access to free scrap metal and old locks. Because you should never pick locks that you do not own, or you own locks that are in use, you will need ways of getting a hold of practice locks. The best way to know that you can pick and rekey a Ruko or an Evva is to pick and rekey them. High-Security locks can necessitate the knowledge of that particular lock. Finding out how certain mechanisms work is reliant on taking some time with it, and taking it apart. Getting a hold of very particular locks can get expensive or time-consuming. Online communities and meet up groups exist that pass locks around to save money in this regard. These groups are undeniably beneficial to not just monetary savings, but also the wealth of knowledge you will have access to. Sharing insights and talking about the craft will deepen your understanding and make the process more personal. It can also be a lot of fun, but it goes to show, that the job spills over into personal life. Conversation and your own free time will start to center around the job. It can be hard to escape, so it needs to be something you enjoy. Always be wary of any of the information you are given, and try to corroborate everything you learn with a practical test or third party validation. Take command of your off-grid solar power system with this new and improved RENOGY 40 AMP MPPT CHARGE CONTROLLER. Unlike a basic PWM Controller, this charge controller is compatible with sealed lead-acid, flooded, and gel batteries (all deep cycle). This controller keeps the batteries from becoming over-charged or discharged, increasing the longevity of your batteries. 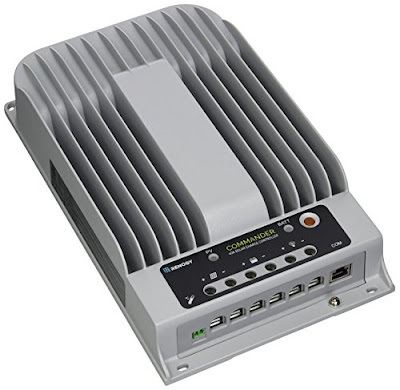 This high tech controller features Multiphase Synchronous Rectification and Maximum Power Point Tracking technologies, which increases charging efficiency and improves system performance. Survival flashlights (for example: SUNJACK LIGHTSTICK ) can also be used for self-defense in the form of a billy club. Even people who carry around other means of protection, such as a firearm or pepper spray, find survival lights to be useful as they can deliver a powerful blow to both humans and animals during the course of an attack. The best survival flashlights come with strobe patterns built in that can be used for signaling purposes. Whether you are trying to flag down a search party during an emergency, another vehicle, or just members on your hiking party the strobe patterns do all the work for you. Before moving on to the top survival flashlight remember that the flashlight that you have on you is the best flashlight, so please check out our article on keychain flashlights that are super small and easy to carry. The earliest and largest watches considered more of the pocket watch types, were invented within used Tudor watches, England in the sixteenth century. These timepieces weren't worn around the wrist then but mostly as a necklace around the neck due to their larger designs. These pocket watches became more commonplace within the earlier seventeenth century and were crafted to be more accurate in their time keeping as well. A man named Mr. John Harrison was a watchmaker by trade and had taught himself this craft completely with great and wonderful results. Mr. Harrison created a greater accuracy within watches of his times and found that the exact time could help in determining precise longitudinal locations of the ships for the Captains. He worked endlessly for over ten years to invent only four Chronometer Harrison Marine watches in the latter seventeenth century; these miraculous watches were also the size of smaller dinner plates. Through many tests by the Queen's Captains these watches proved their worthiness to her and Mr. Harrison then received $20,000 in pounds as a prize for his creative and helpful inventions by Queen Anne of England herself. The history of wrist watches began with a man named Patik Phillippe in the early nineteenth century. Wrist watches were worn at this time mostly by women as accessories; the men carried pocket styled watches as their timepieces. During this century, the watch company called Rolex was opened and owned by Mr. Hans Wilsdorf in the year 1905. Wrist watches gained an added quality by the addition of an alarm within them in the year 1914 and the watch company called Seiko was opened in the year 1924 within Tokyo. In the twentieth century, wrist watches were very popular, but some men still loved their tried and true pocket watches and these were still being manufactured in larger quantities up until the 2nd World War when production decreased dramatically. In the year 1952, wrist watches that were powered by batteries instead of winding mechanisms were out on the markets; this was a large and wonderful advancement within the timepiece era. Watches, which were electronic, were the most popular in the 70's and in the 90's a reemergence of mechanical watches happened due to vintage and nostalgic wants in the watch markets of that time. 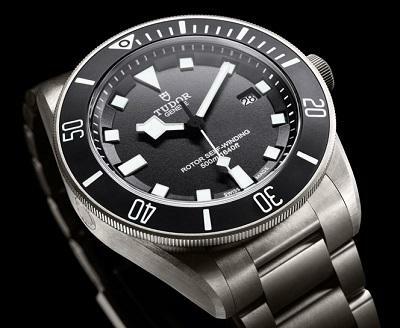 Over 25% of Swiss made watches are all mechanical and not electronic. 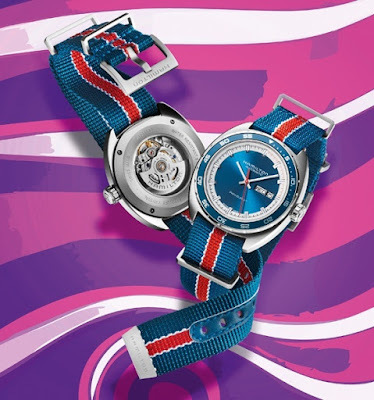 They keep to the original quality that first endeared these timepieces to their clientele and faithful customers. The ability of layered fabrics to insulate against the cold has been known for a long time. Handmade patchwork quilts as we know them are made of three layers: the quilt top, the batting and the quilt back. The quilting is the stitching that bonds these three layers together to create the quilt. quilters use polyester rather than cotton batting? A polyester bat is easier to quilt, it has more loft (better memory) and it shows off the quilting more effectively than cotton batting. A handmade quilt with polyester batting is also easier to care for, it dries faster and the batting will not shift or shrink with use. Also, the quilt does not retain body moisture and it is much warmer than a quilt with a cotton batting. 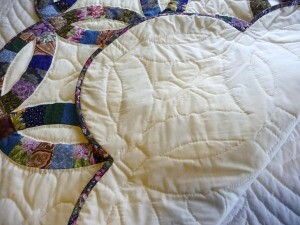 The quilt back, like the top, is made of fabric and should always be quilt grade cotton. Some quilt makers prefer aAmish quilts for sale solid fabric shift , wrinkle, bunch or move in any way while the quilting is underway. 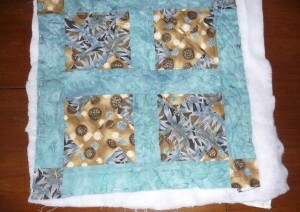 The quilt is then stitched together via either hand or machine quilting. Handmade Quilts for Sale The last step involved in quilt making is to bind the edges. This is the closing or sealing up of the three layers at the quilt’s edges and this is of course done on all four sides. The batting and backing are trimmed to be just short of the binding strip. 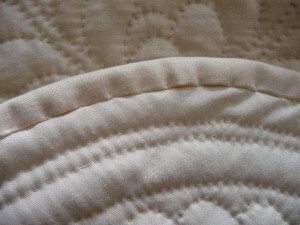 The binding is folded over the quilt’s edges and then sewn to the back of the quilt using a blind stitch. It’s like folding over and sealing the flap at the back of an envelope.